People get defensive when they receive negative feedback. It’s hard not to. Everyone wants to be seen as competent, and when we receive negative feedback, our competence is called into question. So we react. I suggest everyone has a Core Team of about five people who love you, know you well, and have your back. Most important is that you trust these people. You Core Team may be personal or professional relationships, or a mixture of both. You may have worked with Core Team members or not. What all Core Team members have in common is that they know you well, want what’s best for you, and will tell you the truth when asked. No one (I know) enjoys writing, delivering or receiving performance feedback. It’s time consuming to write, challenging to deliver, and can be difficult to hear. Unfortunately, most performance management systems – goal setting forms, performance appraisal templates and online templates – don’t make the process easier. Ins tead, they make it harder. Short and simple is best. When I started managing leadership development for a large company, I inherited a 12-page performance appraisal form and what seemed like 89 competencies. One of the business leaders I supported told me, “I’m not asking my people to use this form. If you can give me something that’s one page, I’ll have my managers use it.” That conversation sent me on a mission to make all performance management forms one or two pages. And really, why shouldn’t they be? People can only focus on leveraging and changing a few things at a time. Why give more feedback than that at any given time? 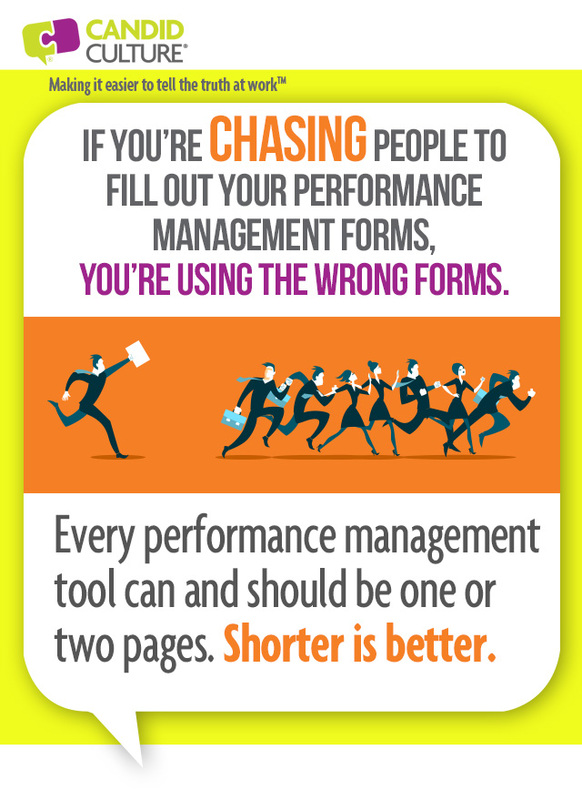 If you’re chasing people to use your performance management tools and templates, you have the wrong forms. In my experience, when people find something easy to use and valuable, they’ll use it. If something is difficult to use or doesn’t seem to add value, people drag their heels. Make your forms and templates simple. No performance management tool should be more than two pages. In a performance appraisal – quarterly, annual, or otherwise – identify up to three things the person did well and a max of three things s/he can either do more, better, or differently next year. Anything more is overwhelming and a set up for disappointment, frustration, and overwhelm. If you have additional areas for the person to work on, meet again in 90-days and assess how the person has done with the three pieces of feedback already provided. If s/he has made significant progress on the things they were already working on, add a few new things to work on. If significant progress hasn’t been made on the existing feedback, wait to add more. I know your existing performance management templates may not allow for what I’m suggesting. If you’re working with a template that requires more input, write up to three clear, succinct, and actionable bullets in each required area and not more. Bullets are better than paragraphs. Be specific. 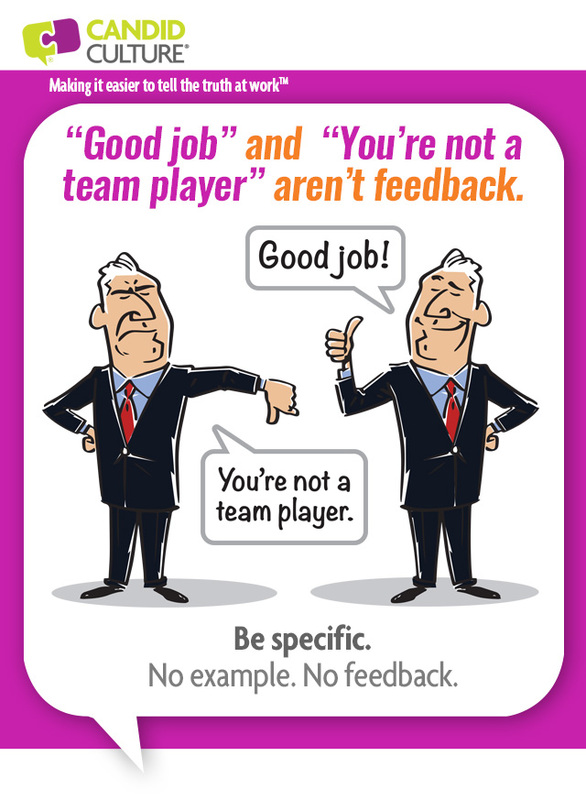 “Great job” is not feedback. Neither is, “needs improvement.” Give a specific example or two. No example, no feedback. Resist the urge to write paragraphs of vague feedback or to accept that type of feedback in a self-appraisal. Paragraphs of feedback take too long to write and often say little. I’d suggest spending less time writing performance feedback and instead spend the time observing performance, asking others for input on the person’s performance, and writing three succinct, specific bullets that describe an action taken or outcome produced. 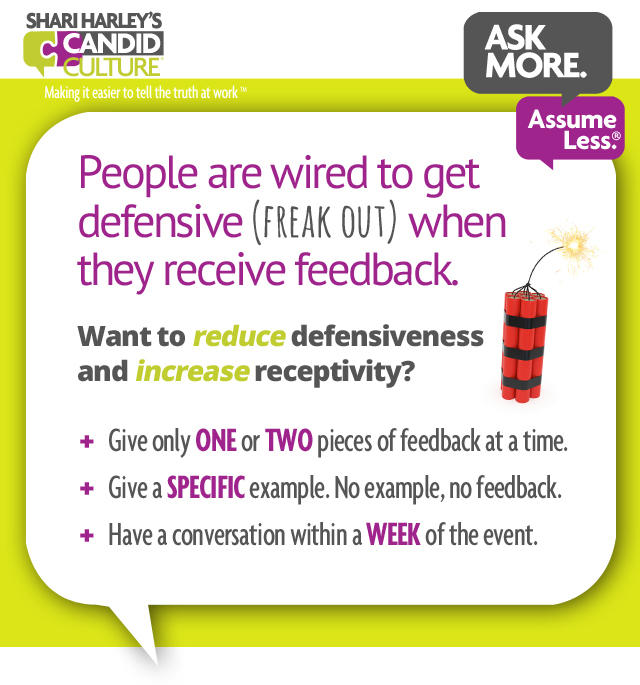 Specific feedback is meaningful, useful, and received with less defensiveness. At some point in your career, you will likely get feedback that doesn’t feel accurate. When receiving feedback you question, rather than dismiss it, vet the feedback with the people who know you best. Assemble a core team of people who know you well, love you, and have your back. The relationships may be personal or professional. These are people who will tell you the truth (as they see it), if you ask. You might think that you’re a different person at home and at work, thus your friends’ and family’s input isn’t valid in the workplace. That’s untrue. You are who you are, and you’re not a completely different person at home and at work. It’s just not possible to be your real self and turn it on and off at work. Sure, you might have a communication style that you only use at work. You may make decisions at work differently than you do personally. And you are likely to dress differently at work than at home. But you’re not a completely different person after 5:00 pm. If you’re often late, don’t keep confidences, talk too much and too long, or wear clothing that is not your friend, your personal relationships can tell you that. It’s important to know how you come across, your reputation, and your wins and losses at work. Having this information allows you to manage your reputation and in turn, your career. So the question is, with whom should you vet feedback that doesn’t feel quite right? Receiving feedback criteria one: Your core team should be made up of a small number of people (five or fewer) who know you well, love you, and have your back. Receiving feedback criteria two: You should respect core team members’ opinions. 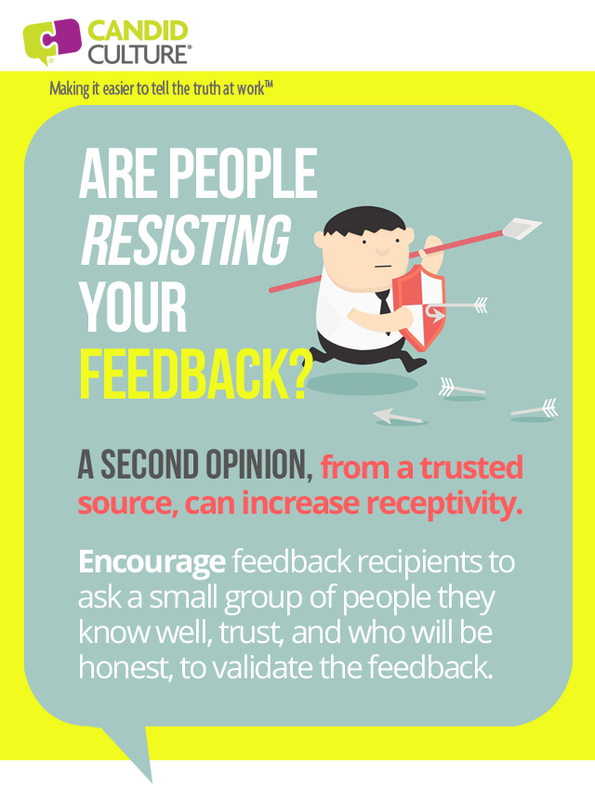 Receiving feedback criteria three: You must trust them and their motives, in relation to your well-being. Receiving feedback criteria four: You must be open to rather than dismissive of core team members’ feedback. The right answer to feedback is always, “Thank you for telling me that,” regardless of how much the feedback stings. 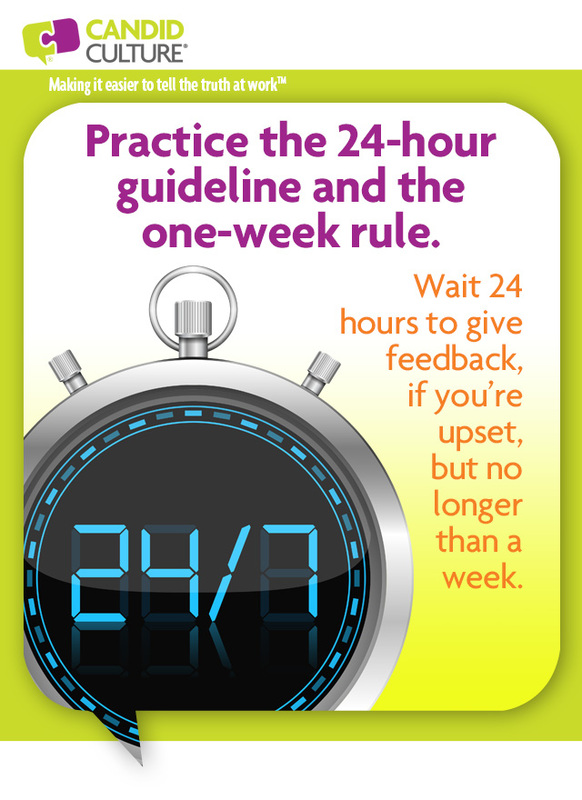 The easier it is to give you feedback, the more you’ll get when you ask in the future. Core team members don’t need to be told they’re on your core team. Simply call these people individually when you need input. 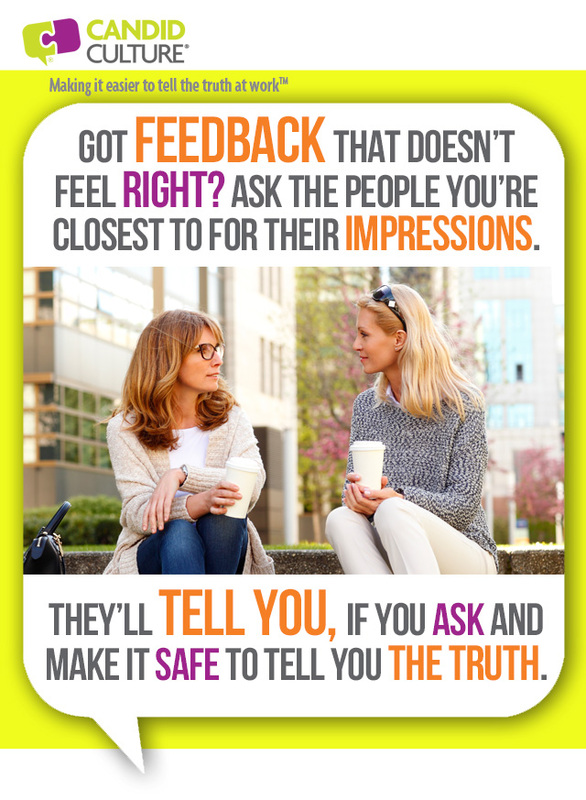 Tell them the feedback you’ve received and ask for their opinion. It’s easy to dismiss feedback that’s hard to hear. And the feedback might just be that person’s opinion. But people talk. And one person’s experience of you can impact your career greatly. Manage your career assertively and powerfully by knowing your reputation. Find out the impressions you create. Then you can make decisions about changes you will and won’t make. 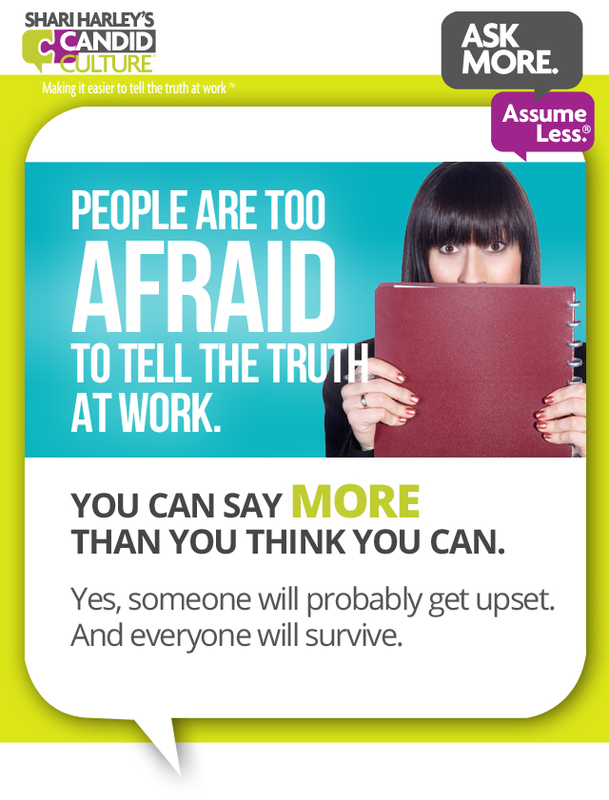 People are too afraid to tell the truth at work. We’re afraid that if we give honest performance feedback, people will get upset. They will. We’re afraid that if we say what we think, we’ll get marginalized, put in a corner, never to be given cool work again. That’s unlikely. We tiptoe around the people we work with, afraid to hurt people’s feelings and rock the boat. This doesn’t work. Without honesty in the workplace, performance won’t improve and problems won’t get solved. Increase honesty in the workplace tip #1: Overtly tell employees that it’s acceptable, safe, and expected that they will make mistakes. If people are afraid to make mistakes, they’ll never risk trying anything new. Create an award for the person who failed while trying to do something new. And present the award very publicly, sending the message that it’s ok to fail. Increase honesty in the workplace tip #2: Set the expectation when you hire and onboard new employees that they will receive regular and balanced (positive and negative) performance feedback. Tell candidates and new employees that giving and receiving honest feedback is part of your organization’s values and culture, and if employees don’t want to give and receive this type of feedback, they shouldn’t work for your company. When you interview employees, ask about a time they received negative feedback and what they did with that information. People who can’t answer this question aren’t self-aware or open to feedback. Don’t hire them. 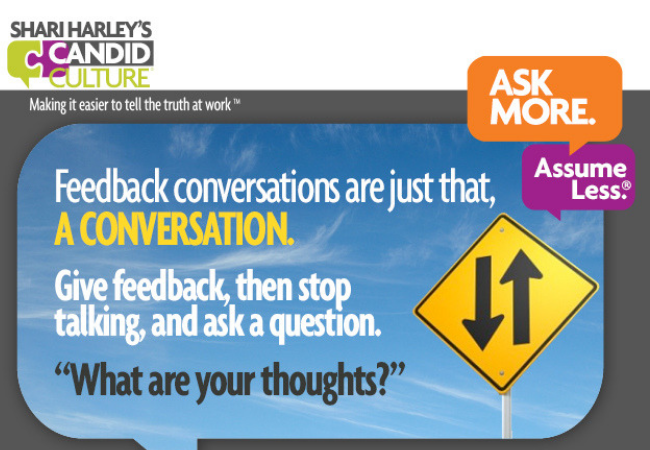 Increase honesty in the workplace tip #3: Create safe places and occasions to give regular feedback. Ensure managers and employees meet one-on-one at least monthly to discuss performance. Give teams a chance to openly talk about how projects are going. Debrief significant projects and pieces of work by asking what did and didn’t work. And ensure managers are asking for employees’ feedback on what the manager can do differently to make work an easier place to be. Feedback goes both ways – up and down. Managers earn the right to give feedback when they’re open to receiving it. While you’re going to ask for feedback, it doesn’t mean that you’re a dumping ground. It’s perfectly ok to tell employees what you want feedback about and what you don’t. If you made a decision and aren’t looking for input, don’t ask for input on that subject. If you receive unsolicited and unwelcomed feedback, say “no thank you.” A feedback-rich culture doesn’t mean you accept feedback on every topic all the time. It’s ok to set boundaries. Increase honesty in the workplace tip #4: Don’t be daunted by people’s negative reaction to feedback. No one likes to be told s/he is wrong and no one wants his/her competence called into question, as a result, becoming defensive when receiving negative feedback is normal and natural. Not becoming defensive is not the norm. People might tell you you’re wrong, turn red, cry, yell, or go silent and pretend you don’t exist for a period of weeks. But everyone will survive. Try not to hire people who won’t talk to you for weeks after receiving feedback. Those folks need to grow up. Increase honesty in the workplace tip #5: Remind people over and over and over that honest feedback is what allows employees and organizations to grow, evolve, and thrive. Not telling the truth creates stagnation and will ultimately lead to individual and organizational failure. The more you give and receive feedback, the more comfortable employees will be with the process. Periodically give yourself a pep talk about being honest with your employees. Letting someone linger in a job in which s/he cannot be successful is not kind, it’s cruel. To talk about people when they’re not present, versus giving candid feedback directly, is also unkind. We all need to man or woman up. Tell employees that everyone in the organization is expected to tell the truth and to do so directly, kindly, and tactfully. Likewise, everyone is expected to be open to receiving feedback graciously. Over time people will become more comfortable speaking up and receiving all types of input. And if you want a feedback-rich culture, the people who can’t or won’t speak candidly, aren’t the right fit for your organization. 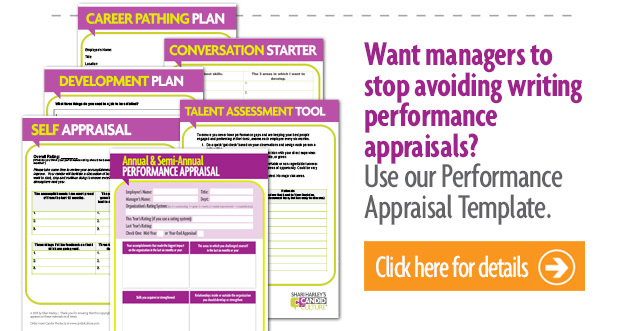 Click below to see our suite of one and two-page performance management templates. And watch for our upcoming webinar on how to write and deliver performance appraisals that are less painful, more useful, and quicker to write and deliver.